If you are not from the South or haven’t spent much time here, it’s possible you have never tasted boiled peanuts (aka goober peas), and you might be a little suspicious of this true Southern delicacy. The best way to enjoy these Southern treats is to purchase at least several pounds of green peanuts when they are at their freshest, make a big batch, and then freeze several bags for later. Easy Southern Boiled Peanuts freeze beautifully and I almost always have a bag of frozen peanuts in our freezer ready to thaw for tailgating, casual get-togethers, the beach, or just plain snacking. Boiled peanuts are made with green peanuts, that is peanuts, which have just been harvested. Green peanuts are highly perishable because of their moisture content and need to be kept refrigerated. The best time to find them at farmers’ markets or your grocery store is in the late summer or fall. Usually, true fresh green peanuts are only available in August and September and then only close to the regions of the country they are harvested in. If you find raw peanuts, unless they are specifically labeled as green peanuts, then most likely they have been dried so they won’t spoil. Green raw peanuts which are freshly harvested have a 35% to 50% moisture content when purchased and dried raw peanuts are dried to a 10% moisture level. 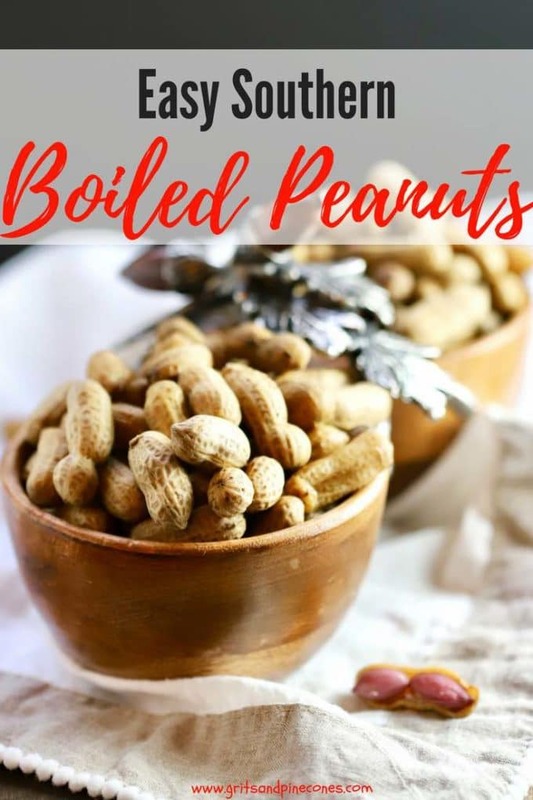 You can’t boil peanuts which have been roasted. 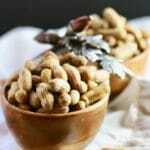 Can you boil raw or roasted peanuts? Raw peanuts, which are different than green peanuts, have been dried to reduce their moisture content and are best roasted. I don’t recommend trying to boil raw peanuts although I know of some cooks that do (they can take up to 8 hours to cook), and forget about boiling roasted peanuts altogether. 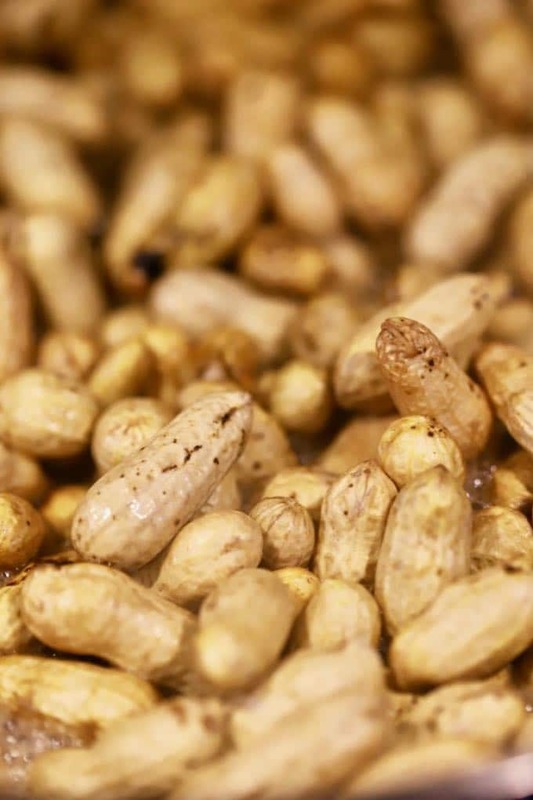 What’s the nutritional value of boiled peanuts? One cup of boiled green peanuts in the shell has 200 calories, 6 grams of dietary fiber, and 9 grams of protein. Add the unshelled peanuts to a large dutch oven or stockpot over high heat and cover with water by at least 2 inches. Stir the peanuts occasionally while they are cooking and be sure to add additional water as needed to keep the peanuts covered in the salty water. How to tell when boiled peanuts are done? Start tasting the peanuts around hour 2. To taste, simply remove them from the pot, crack open the shell and taste the cooked peanut. Some folks like their peanuts on the crisper side, others like me, like them a little softer, it’s all up to you. The consistency should be similar to a cooked dry pea or black-eyed peas. When the peanuts are done, turn off the heat and allow the peanuts to sit in the brine for another hour or so while they cool. Can you cook boiled peanuts in a crockpot? Yes! Just follow the directions below for regular boiled peanuts but place them in a crock-pot or slow cooker. Cook on high for 5-7 hours, or low for 8-10 hours. How to serve and eat boiled peanuts. 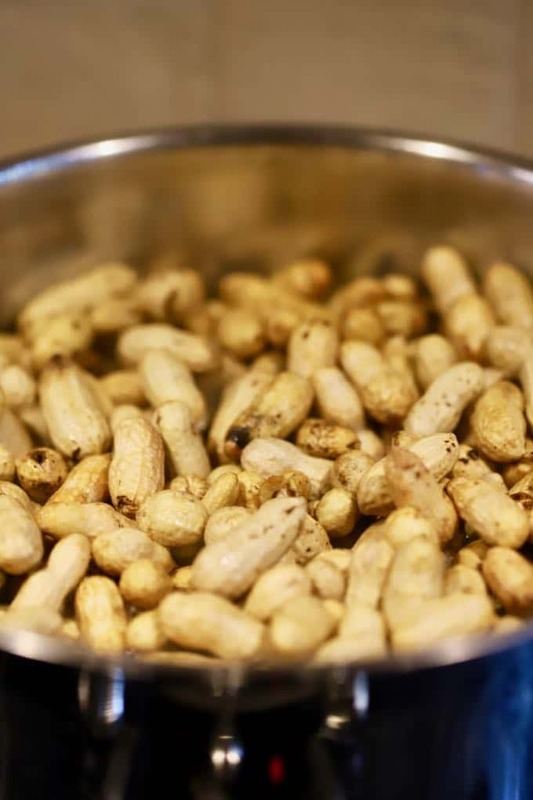 To serve boiled peanuts, use a slotted spoon and remove the peanuts from the cooking brine. Serve boiled peanuts at room temperature and be sure to provide plates or small bowls for the discarded shells. How to store boiled peanuts. If you have leftover boiled peanuts, store them in their brine, covered in the refrigerator, for up to a week. 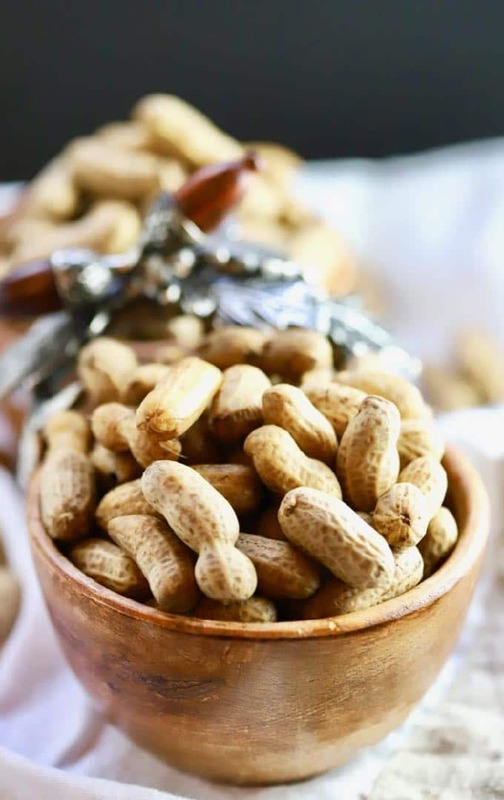 To freeze boiled peanuts, place them in quart-size freezer storage bags along with a little of their brine. They will keep in the freezer for at least 8-9 months. Thaw before serving. Easy Southern Boiled Peanuts are green peanuts which have been boiled in water and salt. After one bite of these delicious, briny legumes you will be hooked! Add the peanuts to a large dutch oven or stock pot over high heat and cover with water by at least 2 inches. Stir the peanuts occasionally while they are cooking and add additional water as needed to keep the peanuts covered in the salty water. Start tasting the peanuts around hour 2. To taste, simply remove them from the pot, crack open the shell and taste the cooked peanut. Some folks like their peanuts on the crisper side, others like me, like them a little softer, it's all up to you. The consistency should be similar to a cooked dry pea or black-eyed peas. When the peanuts are done, turn off the heat and allow the peanuts to sit in the brine for another few hours while they cool. To serve, use a slotted spoon and remove the peanuts from the brine. Serve boiled peanuts at room temperature and be sure to provide plates or small bowls for the shells. If you have leftover boiled peanuts, store them covered in the refrigerator, in their brine for up to a week. To cook boiled peanuts in a crock pot, follow the directions for regular boiled peanuts but place them in a crock-pot or slow cooker. Cook on high for 5-7 hours, or low for 8-10 hours. I've heard you can substitute boiled peanuts for chickpeas to make hummus, but haven't tried that yet. If you have, please let me know how it turned out! What kind of green peanuts are best for boiling. My recipe is for fresh green raw peanuts which have just been harvested. Usually, true fresh green peanuts are only available in August and September and then only close to the regions of the country they are harvested in. If you find raw peanuts, unless they are specifically labeled as green peanuts, then most likely they have been dried so they won’t spoil. Fresh green peanuts should only take about 2 hours to cook, raw peanuts will need about 8 hours.